This week during our Praise A Parent Campaign, I have been noticing and thinking about all the things that are part of a mother’s job description. Often people think a mother’s job is simply the physical care of children. But that’s the easy part. A child’s development, which so often seems just to happen, is actually the result of a learning process. Mothers themselves sometimes don’t seem to realize when they are teaching and how much they are teaching. Child rearing is really education. A child must learn the skills he needs to function independently and the behavior that will help him become a social being. And usually his mother is his first teacher. Mothers teach children to drink from a cup, to eat with a spoon and fork, to dress themselves, to use the toilet. They teach children to put away their toys, to share, not to hit or bite, to respect the rights of others. They help children develop the skills they need, and teach them acceptable behavior. This teaching and learning takes place in many different ways – some that we don’t even think about. Children learn a lot by watching us – which we often don’t even realize until we see them imitating our behavior, or hear our words coming back to us. They learn through repetition – how many times have you had to read the same story? They learn through trial and error. They learn by watching, listening, doing. They learn through experiences that are pleasurable (at times not so pleasurable), and not beyond their capabilities. So, to be successful we have to match the way we are teaching to what a child is physically, emotionally, and intellectually capable of learning. Obviously, you wouldn’t use complicated verbal instructions with a child who is just beginning to use language. You wouldn’t try to teach her to tie her shoelaces if she didn’t yet have the fine motor coordination that would enable her to succeed. Other kinds of teaching and learning are not as clear cut. How do mothers learn how to do this? Largely they learn from their observation and understanding of their own children. A mother learns such things as how long her child is able to concentrate on a task, how much help he is likely to need to accomplish a task she has in mind, how much self-control he is capable of, what kinds of situations are particularly frustrating to him. If she is off base, her child’s reactions and behavior let her know that soon enough. A mother learns from her child what she needs to know in order most effectively to help him learn from her. It’s kind of a reciprocal learning process. Mothers come to see me when they get stuck in this process. Why do they get stuck? At times this happens when children respond or behave in ways that you don’t expect. Or in ways that you don’t like. That’s when thoughts start to go in the direction of “what’s wrong?” “ Is this normal?” But mothers almost always know the answers to their own questions. I have found that mothers often don’t know how much they know. They certainly know their own children better than anyone else. Whenever I ask a mother why she thinks her child is behaving in a particular way she almost always knows the answer. She just doesn’t believe she knows the answer. I often ask a mother, if your child could tell you in words what he is saying through his behavior, what would he say? Bingo! Moms almost always can tell me. Once you know what your child is telling you, it’s not that hard to figure out what to do about it. The fact that mothers know their children as well as they do enables them to be good teachers. Since starting this campaign I have seen moms teaching in so many ways. The mom I saw who was explaining to her little one why steam was coming out of a building vent. The mom who was helping her child become less irritable by finding the pleasure in a social exchange. The mom in the park who was doing conflict resolution when two kids each wanted to play the game his way. The mom I overheard helping her daughter feel less anxious about a camp activity. These are some of the things we frequently take for granted that we need instead to notice and praise. 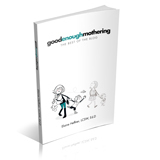 We are the ones who can let other mothers know they are doing a good job.